Welcome to the newest online issue of Scotch Bonnet. This marine education newsletter also is available as a PDF, if you’re like me and want to keep a hard copy. Thanks to Meredith Bruhn, Melissa Dowland, Gail Lemiec, Maria McDaniel, Harris Muhlstein, Michelle Pearce, Kayla Phillips, Laura Sirak-Schaeffer, Renee Strnad, Dave Sybert and Erika Winspear for their contributions to this issue. Wishing you all wonderful winter and spring seasons! As you explore this new issue of Scotch Bonnet, you will notice professional development opportunities and family adventures for everyone. Take advantage of these wonderful conferences, workshops and more, especially if you’re working on your environmental education certification. There’s a lot going on in North Carolina and beyond! When: Thursday, Feb. 7; 5:45 to 8:00 p.m. 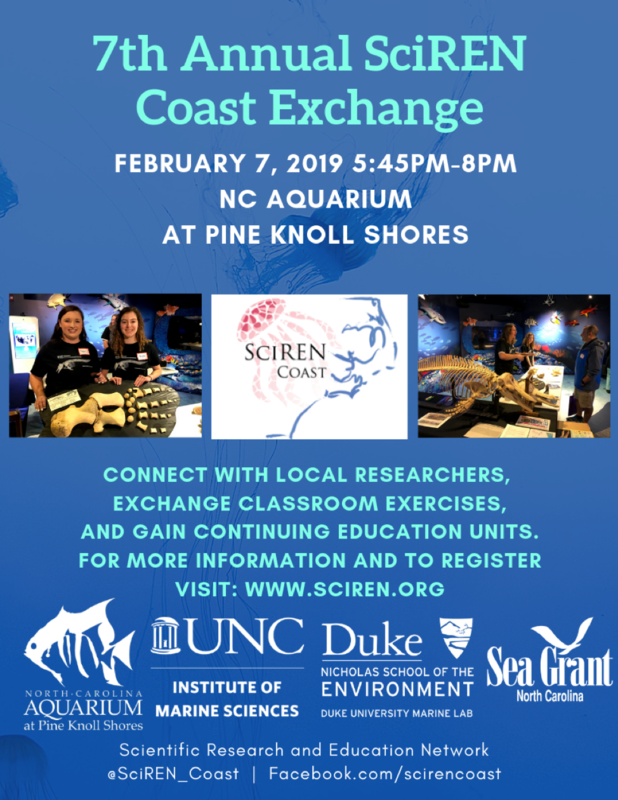 The North Carolina Aquarium at Pine Knoll Shores will host the seventh annual SciREN Coast event on Thursday, Feb. 7, from 5:45 to 8:00 p.m. The event connects educators with local researchers who will provide science-themed exercises and activities for use in the classroom. All educators — including private, formal, informal and homeschool — are encouraged to attend. Continuing education units will be available after additional homework. Registration is open now at sciren.org. Refreshments will be provided. When: Saturday, Feb. 9; 10:00 a.m. to 5:00 p.m.
…a classroom teacher looking to incorporate more environmental education (EE) into your lessons? …an informal educator hoping to incorporate more grade level standards into your programs? …a K-5 pre-service teacher looking for more resources to implement science methods? If you said “Yes!” to any of these questions, then a Project OWL workshop is the place for you. Project OWL (Outdoor Wonders and Learning) is an EE curriculum guide written and designed to match North Carolina essential standards for elementary grades. It focuses on science, but also meets math, social studies and English language arts standards when applicable. During the workshop, participants will try out Project OWL activities and learn more about how they work on their own or as part of a larger lesson. This workshop also offers time for creating programs and lessons using a learning cycle method and opportunities for participants to update an old favorite lesson. This workshop is led by Michelle Pearce, coordinator of school and public programs at The North Carolina Arboretum and for Project OWL. The workshop can count for continuing education units for classroom teachers and/or Criteria I or III credits for N.C. environmental education certification. When: Saturday, Feb. 9; 9:00 a.m. to 3:30 p.m. The North Carolina Aquarium at Fort Fisher presents Sea Turtle Exploration, a curriculum to help educators engage students in the fundamentals of STEAM through ready-to-use, standards-based lesson plans and sea turtles. Join the aquarium on Saturday, Feb. 9, for a hands-on teacher workshop that will guide participants through the new curriculum — aligned with the new Common Core standards — and website. Attendees will learn about additional resources, such as weekly blog posts, that will be available during the school year. Topics will include species profiles, aquarium staff spotlights, behind-the-scenes videos, new lesson plans and more. Students will even be able to follow the growth of aquarium hatchling sea turtles by visiting the blog each week. Classes can “adopt” a turtle and learn about its care and growth. In addition, they will receive weekly updates with information on the turtle’s current weight and length. Each class will receive a certificate of participation as well. Please bring a reusable water bottle. You may choose to pack a waste-free lunch. Our snack shop, Shark Bites, will be open, and there are lunch options off-site. This workshop will count towards N.C. environmental education certification (Criteria I) and consists of 6 contact hours that may count toward continuing education units (CEUs) for teachers. This workshop will be repeated on April 27 — see specifics later in this newsletter. *The Oak Island Beach Preservation Society will pay the registration fee for any formal or informal Brunswick County educators. When: Saturday, March 23; 8:30 a.m. to 12:30 p.m.
Come and improve your identification skills by birding in different habitats with the N.C. Wildlife Resources Commission. 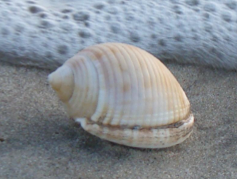 We will discover wintering species on the beach, in the marsh and in edge habitats along the way. The group will meet at the aquarium and review birding basics and field guides. We will explore different locations along the N.C. Birding Trail in the coastal plain, including Fort Fisher State Recreation Area and the area surrounding the aquarium. The hike will be approximately 2 miles, maximum. Please wear weather-appropriate attire and closed-toed shoes, and bring binoculars and plenty of water. If you do not have binoculars, some will be provided, but the quantity is limited. This workshop and all materials are free to participants. Pre-registration is required. To register, please email or call Lauren Donald at lauren.donald@ncaquariums.com or 910-772-0542. For any workshop-related questions, please feel free to email Rebecca Skiba at rebecca.skiba@ncwildlife.org. When: Saturday, April 27; 9:00 a.m. to 3:30 p.m.
A repeat of the Feb. 9 workshop — see description above. When: Wednesday, Feb. 27; 9:00 a.m. to 3:30 p.m. Flying WILD provides activities to teach middle school students about birds, their migration, and what people can do to help birds and their habitats. Educator CC King, of the N.C. Wildlife Resources Commission, will lead activities for formal and informal educators interested in teaching kids about birds and birding and the importance of wildlife. Participants will be eligible for Criteria I credit for N.C. environmental education certification or continuing education units upon request. Bring a bag lunch and dress for the weather. Pre-registration is required. For more information, contact Kayla Phillips at kayla.phillips@raleighnc.gov or 919-233-2121. The N.C. Museum of Natural Sciences offers a variety of educator programs throughout the year. Here are descriptions of one teacher trek and two Educators of Excellence explorations for the spring and summer. Prepare to observe the explosion of life as spring arrives in North Carolina! Discover ways to bring spring into your classroom. Examine the incredible miracle of bud burst as trees begin to leaf out and flower. Explore signs of spring, such as early wildflowers and amphibian breeding pools. Learn how to better appreciate and study this magical time of year. *Optionally, and weather-dependently, join us for dinner and frog call listening and salamander stalking after dark. EDUCATORS OF EXCELLENCE INSTITUTES, SUMMER 2019 – Applications due March 4! Since 1987, educators from across North Carolina have been inspired by their experiences in outstanding natural areas. The Institutes are available at low cost because of the support from the Friends of the Museum’s Educators of Excellence Fund. This year join us in Yellowstone or Peru for the experience of a lifetime! Participating educators will study and experience the wonders of the world’s first national park. Join us from sunrise to sunset as we observe the incredible wildlife of Yellowstone, including bears, bison, wolves and elk. Learn about the area’s unique geology while exploring the fascinating world of geysers, hot springs and mudpots. Enjoy the magnificent scenery of the northern Rocky Mountains as we hike trails throughout the park. The daily program will include field experiences, opportunities to meet with park staff and other experts, and activities designed to help integrate your experiences into the classroom. Discover strategies for exploring the connections between Yellowstone and North Carolina, such as wolf and elk reintroduction, fire ecology, resource management issues and much more. During the trip, participants will provide daily updates to students in North Carolina via a blog. Participants will experience first-hand the unique ecosystem of the Amazon rainforest in northeastern Peru. Educators will spend nine days learning about the native flora, fauna and cultural history as they explore on foot and by boat along the Amazon and Napo rivers near Iquitos, Peru. The daily program will include practical field experiences, basic local natural history, and easily duplicated techniques for teaching natural sciences in the classroom. During the trip, participants will provide daily updates to students in North Carolina via a blog. This program is designed to give educators a direct experience with environments and concepts that are part of the N.C. curriculum. Looking for other opportunities? For information about additional teacher education programs, contact Melissa Dowland at melissa.dowland@naturalsciences.org or 919-707-9898. When: Saturday, March 16; 11:00 a.m. to 3:00 p.m. The fourth annual Science Expo, sponsored by A Time for Science, is set for Saturday, March 16, from 11:00 a.m. until 3:00 p.m. The goal of the Expo is to showcase science centers all over the eastern part of North Carolina, as well as university departments and businesses that deal with science topics. Over 40 participants will offer hands-on activities for learners of all ages. Enjoy presentations in a mobile planetarium, observe live animals and participate in different demonstrations offered throughout the event. This year is shaping up to be a great Expo, so come out to downtown Greenville and learn about science! When: Saturday, March 23; 9:00 a.m. to 4:00 p.m. Please see description of the Project OWL (Outdoor Wonders and Learning) workshop above, under the N.C. Arboretum section. When: Friday, April 12; 6:00 to 9:00 p.m.
Come out to the Cape Fear Botanical Garden and gaze at the stars. Walk a luminary-lit path as you learn facts about the sky, sit by the fire as you gaze at the stars, and meet local astronomy enthusiasts who will help you explore the night sky. There will be scheduled and ongoing activities to pique the interest of astronomers of all levels. This is a great date night or family event. Please bring a flashlight. This event is part of the North Carolina Statewide Science Festival and the Statewide Star Party, with support from North Carolina Space Grant. For more fun science events during the festival, go to ncsciencefestival.org/. When: Tuesday, April 23; 9:00 a.m. to 3:30 p.m.
Project WET (Water Education for Teachers) is an interdisciplinary water education program intended to supplement a school’s existing curriculum. The goal of Project WET is to facilitate and promote the awareness, appreciation, knowledge and stewardship of water resources through the development and dissemination of classroom-ready teaching aids and through the establishment of state-sponsored Project WET programs. Project WET offers the educator activity guides and modules designed for grades K-12. By using Project WET services and resource materials, young people will gain the knowledge, skill and commitment needed to make informed decisions about water resource uses and conservation. Since 1976, Project Learning Tree (PLT) has been using trees as a lens into our natural and built environments to teach students “how to think, not what to think” about complex environmental issues. Check out this short video (go.ncsu.edu/PLTworkshops) to see some activities in action and hear from students and teachers! When: Tuesday, March 26; 9:30 a.m. to 3:30 p.m.
Join other K-8 classroom and informal educators as we explore activities in the Project Learning Tree K-8 Curriculum Guide. Every participant will leave the workshop with this guide, which includes 96 activities correlated with the N.C. Standard Course of Study and Essential Standards. The PLT activity guides are provided free of charge to participants through support from the N.C. Forestry Association. Continuing education units are available. 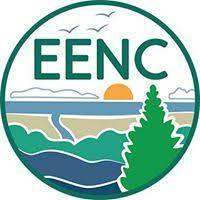 This workshop qualifies for Criteria I in the N.C. Environmental Education (EE) Certification Program. Questions? Contact Renee Strnad at renee_strnad@ncsu.edu. When: Wednesday, April 17; 9:00 a.m. to 3:30 p.m. This workshop will cover the Southeastern Forests and Climate Change (SFCC) secondary module and the NEW Carbon & Climate e-unit. Project Learning Tree® (PLT) and PINEMAP have partnered to develop a secondary module on climate change impacts on southern forest ecosystems, the role of forests in sequestering carbon, and strategies for reducing greenhouse gas emissions and adapting to changing climatic conditions. The module is designed for use in life science, environmental science and agriculture courses in grades 9-12, with potential use in middle school or community college courses. The Carbon & Climate e-unit was developed for grades 6-8 and is an integrated online unit provided through PLT’s online portal. There is a $20 registration fee for this workshop. All participants will leave with a printed SFCC activity guide, access to the online SFCC portal and the Climate & Carbon e-unit. This workshop will be presented by N.C. PLT coordinator Renee Strnad. Please make a personal commitment to attend to ensure there are enough materials and space for everyone. Cancellations made by April 11 will receive a $10 refund. Cancellations after April 11 will not receive a refund. Questions? Contact Stacie Hagwood at stacie.hagwood@raleighnc.gov. 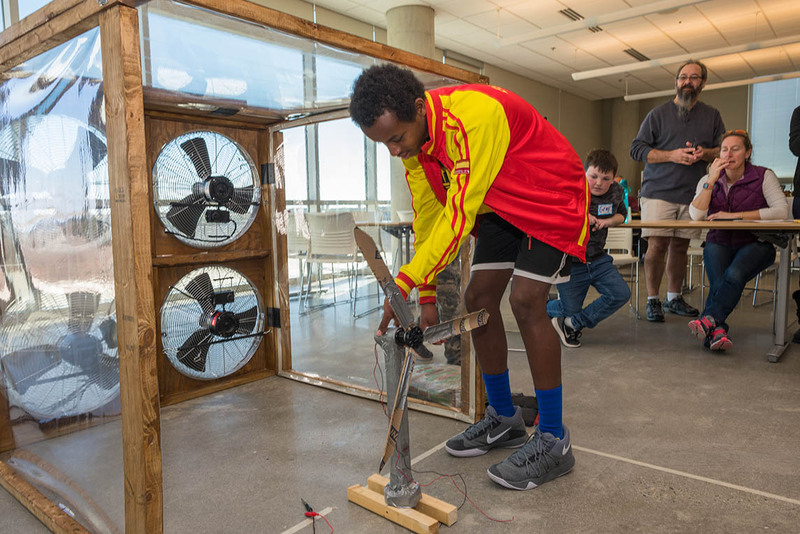 On April 6, East Carolina University’s (ECU) Coastal Studies Institute (CSI) will host the third annual N.C. Renewable Energy Challenge, in partnership with KidWind, Jennette’s Pier and Appalachian State University. Student teams are challenged to design and construct an alternative energy device that will create the most possible power; document and present their research and construction process; and engage in a variety of instant challenges. The competition is broken into 4-8 grade and 9-12 grade divisions. Winners of the wind turbine divisions will qualify to move onto the national event held at Windpower in Houston in May. The N.C. Renewable Energy Challenge will take place on April 6 at CSI, located on the ECU Outer Banks Campus at 850 Highway 345, Wanchese. Please stay tuned for additional details regarding registration, prizes and teacher incentives. For more information, please visit coastalstudiesinstitute.org/education, or contact David Sybert at sybertd@ecu.edu or 252-475-5451. Forest to Classroom (F2C) is a professional development program housed within Extension Forestry at NC State University. The program was created to connect educators to forest resources in North Carolina and to assist with implementing forestry education in the classroom. Forestry remains one of North Carolina’s top industries, with over 18.6 million acres of forestland in the state. In F2C, teachers also lead their own professional development though participation in an implementation forum. This arrangement provides every F2C teacher an opportunity to share their expertise as well as gain knowledge. Because STEM education has become a priority in many school districts, the 2019 F2C program is dedicated to STEM topics. This year’s F2C is designed to help educators combine STEM and environmental education in their classrooms. The program will include field days, a mill tour to see technology in action, as well as classroom instruction. Instructors will include county science specialists, university educators and environmental educators. Activities from Project Learning Tree will be used to help teachers carry what they learn back to the classroom. Applications are now being accepted for the 2019 program. The deadline is May 31. The 2019 F2C is geared towards formal and informal educators working with elementary and middle school students (1-8 grade). STEM area teachers are preferred, but any subject area will be considered. Note: Teachers from outside of North Carolina are eligible to apply. Space is limited to 30 educators, with final selection based on application quality. Nonformal educators are encouraged to apply with the understanding that priority is given to formal classroom educators. MarineQuest is the official marine science outreach program for the University of North Carolina Wilmington, Watson College of Education, and the Center for Marine Science. It provides young people with opportunities to explore, discover and value our marine habitats. 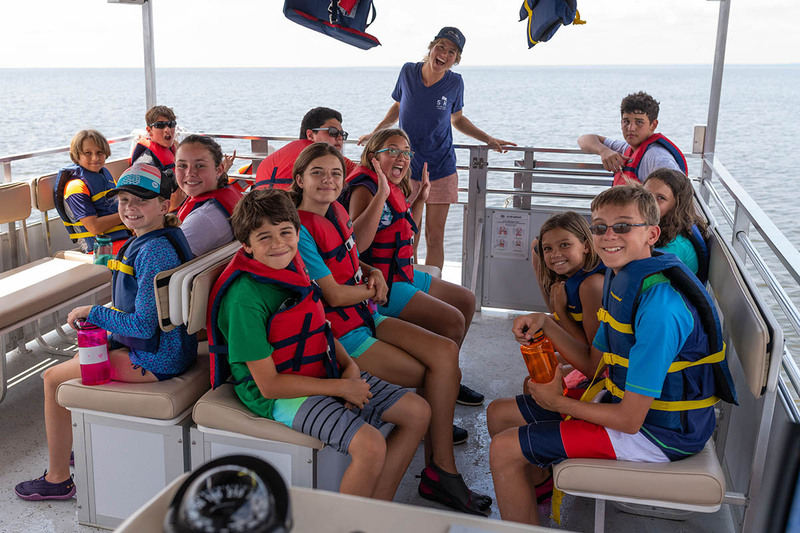 Throughout the school year, MarineQuest is a highly desired program among school groups looking for hands-on, STEM-driven marine science field trip experiences. Hurricane Florence severely impacted the greater Wilmington community, and MarineQuest’s operations were no exception. The MarineQuest lab that hosted visiting school programs suffered significant damage. In addition, due to the monumental number of school hours missed in New Hanover and surrounding counties, many school systems enacted a “no field trip” policy to make up for lost school time. In response, MarineQuest developed a free outreach initiative entitled “Hurricane Florence: Science, Impact, and Recovery,” to be delivered to schools affected by the storm. As part of this initiative, lessons appropriate for 4-12 grade audiences were developed in collaboration with UNCW’s Engineering Expectations. Lessons covered topics related to extreme weather preparedness and recovery, as well as storm impacts related to weather, water quality and pollution. Each lesson incorporated real hurricane data collected by researchers at UNCW’s Center for Marine Science. Students could experiment with various technology and equipment, including PocketLab sensors, Vernier probe ware, anemometers, refractometers, tablet computers and pH indicators. MarineQuest began advertising this free outreach opportunity in mid-October, and the response from schools was tremendous. From Oct. 23 to Dec. 21, MarineQuest traveled over 1,465 miles; delivered programs to 25 schools in New Hanover, Brunswick, Onslow, Duplin, Johnston and Pender counties; and worked with more than 2,300 students. As this outreach initiative ends, MarineQuest is ready to open its doors once again to visiting school groups, educators and other members of the community. Please visit our website at uncw.edu/marinequest, or contact Harris Muhlstein, MarineQuest’s school program coordinator, at muhlsteinh@uncw.edu or 910-962-3795 to find out more about field trip opportunities, upcoming teacher workshop offerings and weekday evening/Saturday outreach events. Turtle Trash Collectors is a University of North Carolina Wilmington MarineQuest outreach program for upper elementary students. The goal of this program, funded by the National Oceanic and Atmospheric Association’s Marine Debris Program, is to educate youth about the impacts of marine debris and to encourage behavior changes to reduce marine debris. During a visit to your school, MarineQuest staff will lead students through a hands-on simulation of a sea turtle necropsy (animal dissection), during which students will determine the turtle’s cause of death. Marine debris items discovered during the simulated dissection include single-use items that the students might use themselves, like plastic bags, snack food wrappers and straws. This simulation will help students understand how single-use items that become marine debris can have major impacts on sea turtles, even causing death. It is our hope that students will be inspired to help save sea turtles after this experience by participating in our Turtle Trash Collectors badging program, which awards digital badges to participants for cleaning up the environment. This badging program can be completed as a class, or students can complete it with their families and friends at home. An adult will need to help students request their digital badges and provide an email address to receive them. We are now scheduling free Turtle Trash Collectors programs for the remainder of the school year and would love to visit your school! This year’s focus is fourth and fifth grade students. If you are interested in having a Turtle Trash Collectors program at your school, please complete the program request form at uncwyouthprograms.wufoo.com/forms/turtle-trash-collectors-2tc-program-request/, or contact program coordinator Laura Sirak-Schaeffer at SirakSchaefferL@uncw.edu or 910-833-0867. East Carolina University’s (ECU) Coastal Studies Institute (CSI), is an interdisciplinary coastal and marine research and education facility located on the Outer Banks of North Carolina. This summer, CSI will offer a variety of educational summer camps focused on science, technology, engineering, art and math (STEAM) for 9-15-year-old students. These camps combine fun, hands-on experiences with STEAM concepts to provide an exciting and educational experience. 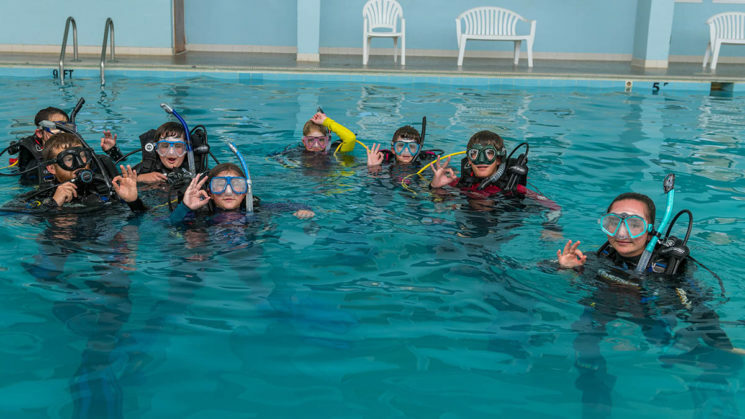 Depending on the camp theme, students may learn to kayak, snorkel, SCUBA dive, build a robot, fish, seine, map a shipwreck, dissect a lionfish or practice techniques in nature photography. Most summer camps are based at CSI, located at the ECU Outer Banks Campus on Roanoke Island. Surf and Science camps, offered in partnership with Jennette’s Pier, are based at Jennette’s Pier in Nags Head. Registration begins March 1. To register or for more information about CSI summer camps, please contact David Sybert at sybertd@ecu.edu or 252-475-5451, or visit coastalstudiesinstitute.org/education/k-12-programs/day-camps/. If you ever have information to share with other marine educators, please don’t hesitate to send it my way for inclusion in a future issue of Scotch Bonnet. Let me know what you’re hearing from the sea! Please share this website or newsletter with others — and share my email address with anyone who wants to receive a message when a new issue of Scotch Bonnet is available online. Thanks for all you do for students and for other educators!